At TipTop Media Management, we’re partnered with a fully licensed waste carrier registered with the Environment Agency to carry out recycling in accordance with WEEE directives. We’re an environmentally conscious company committed to promoting good practice through providing efficient business recycling in London. All recycling is done to the highest UK environmental standards and any electricity generated from the procedure is used to power the recycling plant, as well as being fed to the national grid. All the metal and plastic is separated and processed ready for re-introduction into UK manufacturing and any un-recyclable waste is used in solid fuels or even road aggregates. Disposing of confidential documents is a well-known security risk for any business; it is recommended that sensitive papers are professionally destroyed and recycled, eliminating all possible access to information. As well as being concerned about their own interests, UK firms are legally obliged to handle with care, and destroy, documents containing personal data about clients. TipTop Media will shred and recycle your paperwork securely, giving you a certificate of confirmation for your records when the process is complete. Documents can be recycled at intervals of your choice: daily, weekly or monthly sessions are viable, and there is no limit on the amount of papers we can handle. Swift, professional document recycling process. Despite digital filing, running a successful business usually involves handling large quantities of paperwork. Information such as payroll documentation, personnel files, financial information and client records, must be treated with care and disposed of in the same manner. * To ensure the health and safety of our customers and drivers are protected at all times additional charges may also be incurred where extra work or time is incurred in the course of the collection. Does your business have secure paper recycling needs? The evolution of media means that data is increasingly being stored digitally; the transition has left many businesses with old tape and film that needs to be irrevocably destroyed. With the current environmental issues surrounding landfill disposal, unwanted and excess media storage needs to be disposed of in a more earth friendly way; this has become a necessity in almost all industries. Companies that handle data have a legal duty to protect any information stored about other individuals and their interests when arranging disposal. 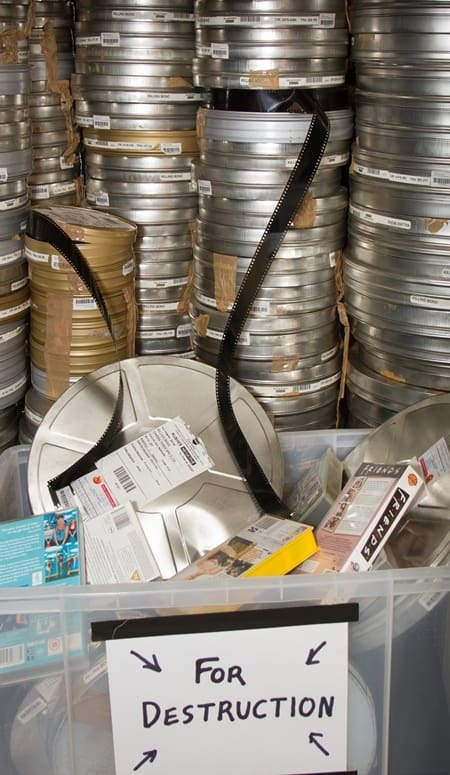 TipTop Media will collect your unwanted tape and film material and securely recycle it, ensuring that information cannot be accessed by outside parties. The large quantities of film and tape now accumulated by firms mean that recycling often needs to be picked up directly from premises. Our drivers will come at an allocated time, making sure that items are fully secured and delivered for recycling. Does your business have a need for tape & film recycling? Identity fraud and identity theft is definitely on the rise and with more and more people owning computers and businesses frequently upgrading their computer systems, we are all now being regularly left with old hard drives which need to be disposed of securely. The more companies evolve, is the more client and business data is transferred to new hard drives but information remains accessible on the discarded hardware and throwing it in the bin is no longer a viable option if security is uppermost in your mind. UK data protection law states that firms must take reasonable care to make sure all clients personal details are secure, making hard drive disposal a difficult proposition but not impossible. In addition, the environmental awareness expected of firms has added an extra burden, with landfill disposal no longer an acceptable option for old media. TipTop Media will securely collect, dismantle and recycle your hard drives, making sure that no-one has undue access to the information stored on them by erasing its contents and then physically shredding the drive which is then separated out into its plastic and metal parts ready for re-introduction into UK manufacturing. 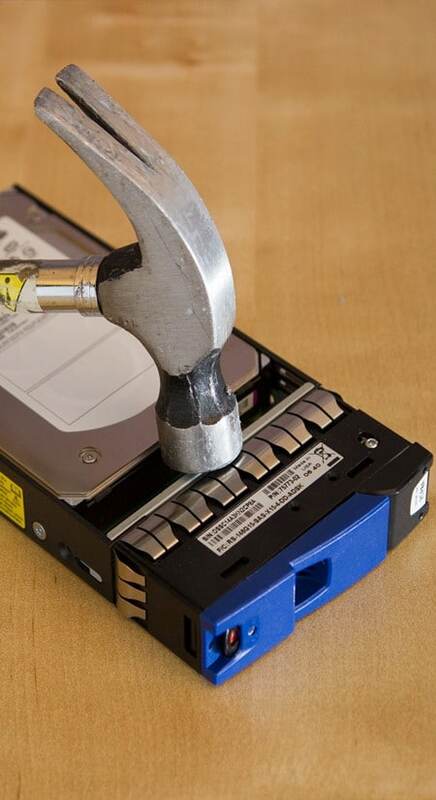 Does your business need to dispose of hard-drives securely? Recycling is an eco-friendly way of destroying items that are no longer needed. Where as normal waste goes to landfill sites and left to sit and decompose, recycling allows reusable items such as plastic, paper and glass to be reincarnated as new material. This lessens the waste of potentially useful constituents. How do i go about recycling unwanted material? You can give us a call detailing what it is that needs to be recycled or failing that, fill out the relevant ‘Get Your Quote’ form above and a member of staff will get back to you. How do i know that my items have been recycled and not just sent to a landfill site? Upon request we can supply customers with a certificate of destruction detailing the authenticity of the transaction. We are also carriers of the Green Mark certification scheme, who’s presence in the eco-friendly industry is known by most. Is this service only offered to clients? No. Any business within London wishing to recycle are more than welcome to use us. How are our media tapes recycled? All media is incinerated and the electricity generated from the procedure is used to power the plant, as well as being fed to the national grid. Ash produced is used in road aggregate and any metal recovered is also reused. How are our documents, folders and boxfiles recycled? 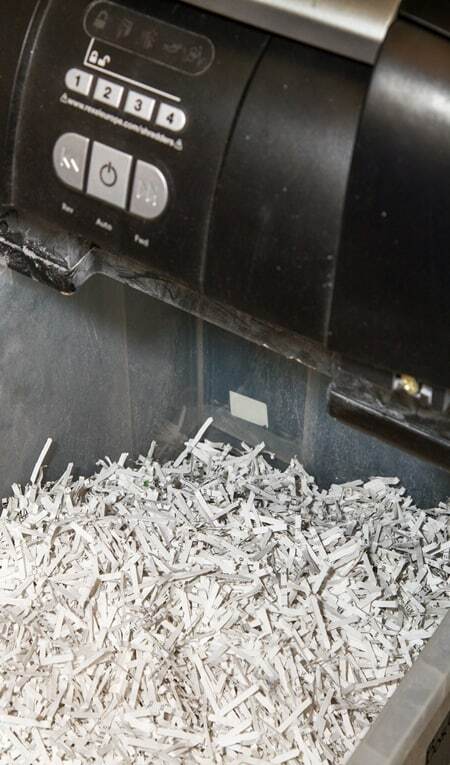 All paperwork is put through our industrial sized cross cut shredder. Once completed the paper is then sent off to be baled, cleaned and made into new paper products. How does confidential recycling differ from normal recycling? Strict guidelines are applied when this service is requested. In theory the process is the same with the differentiation being that the documents are first shredded before being recycled.